To give credit to the story, the BBC used the testimony of the only survivor in the family: “Hooded people came with police officers and locked up nine people in a room on the second floor and burned us alive.” According to the same testimony, the offenders carried “mortars, weapons, and Molotov bombs”. We can only respect the bereavement of the survivor. But it cannot be dismissed that under shock, and calling for divine justice, she felt the need to find an immediate culprit. This is why it cannot be excluded that her testimony has been influenced in any way so as to channel her anger and to politically exploit it. In an effort to get closer to the truth, it is necessary to look for additional information and to cross-check them with other testimonies and documents. Not really intimidated by the crime in the Velasquez house, four members of the M-19 were present on the scene the same day, to record a video where they accuse the government of “state terrorism” and call to support their movement. They take the opportunity to send a message to the negotiation table: “We are not going to remove the barricades, they are in our hands and those of the people, and we will not take them off. I want you to know: if the people do not unite, it will end up in new massacres like this one”. But have their accusations, carried by certain media and Internet users on social media, been the subject of a real inquiry gathering enough facts? On May 30, the 18-year-old Mario Alberto Medina’s family, who died in September 2017, condemns the “unscrupulous actions of people who are using the young man’s photographs to add them to the list of dead”. On June 14, the Nicaraguan Foreign Ministry replied in a letter that the work of the IACHR had still not taken into account “evidence of atrocious crimes, cruel and degrading treatment, kidnapping and other acts of violence committed against the population and especially against public officials and persons known to be Sandinistas “. Given the biased stance it is accused of, the authorization to visit the premises that the Ortega government granted to the IACHR on June 26, must be considered as a concession in the framework of peace negotiations between the two parties. Especially since institutions like Amnesty International have clearly shown that they are on the other side of the barricade, turning a deaf ear to the testimonies that are not aligned with the dominant narrative. First, on June 18 the Civic Alliance, the political opposition movement engaged in dialogue with the government, announced its withdrawal from the negotiation table and demanded the presence of external observers. The reactions were immediate, notably that of the representative of the OAS Luis Almagro and the IACHR… and finally the unavoidable press release of the spokesperson of the US Department of State Heather Nauert, condemning the ‘current violence sponsored by the government, including the attack on June 16 against the residence and trade of a family…”. Nauert recommended that the government should carry on according to the points on the peace agenda, including the planned visit of observers of the IACHR. Her conclusion is quite significant: the United States “takes note of the general appeal of Nicaraguans for new presidential elections” and “considers that the elections would be a constructive way forward”! When the United States presents itself as the defender of human rights and the champion of democracy in the world, it should be remembered that in recent years bodies dedicated to “promoting democracy”, such as USAID or the NED, showered opposition movements with dollars (support that the protesters do not hide). Simultaneously, Senator Marco Rubio proposed to use the Magnitsky Act as a weapon of financial sanctions against the Vice-President of the mixed enterprise Albanisa. What was Rubio’s aim? “Not only to support the desire for new elections as soon as possible to change the government, but also change the constitution, because a new government on the basis of corruption and dictatorship is more or less the same thing.” Helping to overthrow the government elected by the Nicaraguan people is not enough, so you have to write directly a new constitution in its place, to prevent these latinos from returning to bad habits! Venezuela’s Contras: Protesters or Terrorists? 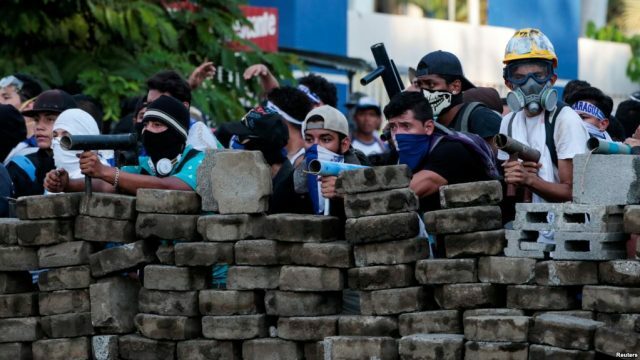 The US & Nicaragua: a Case Study in Historical Amnesia & Blindness Nicaragua: Legitimacy And Human Rights In Nicaragua, is Operation “Contra bis” failing?